There have been over 36,000 IBCs incorporated in The Bahamas since 1990. A Bahamian IBC may be incorporated within 24 hours. Since the enactment of the International Business Companies (IBC) Act, 1989, The Bahamas has experienced a phenomenal number of IBC registrations. There have been over 36,000 IBCs incorporated in The Bahamas since 1990. The International Business Companies Act (1989) was created and molded with the intention of producing a modern facility to provide for a natural person or group of persons to do through the vehicle of a corporate entity anything which an individual person may do or wish to do. Reservation of company names may be facilitated by facsimile transmission through a local agent (lawyer or accountant, or Trust Company). A Bahamian IBC may be incorporated within 24 hours; this must be done by the local agent, as required by relevant legislation. IBCs are used for a variety of purposes, including formation of mutual funds, ship registration, conducting export/import trade, etc. The IBC Act also allows for the formation of Limited Duration Companies (LDCs), and there is legislation which makes provision for the establishment of Exempted Limited Liability Partnerships. There is no fixed limit on the amount of authorized capital. A minimum of two subscribers can form an IBC. The company can use fractional shares, registered shares, or bearer shares. No public records are maintained as to the identity of shareholders or directors. It may have at least one director, who may be individual or corporate and of any nationality. Meetings may be held by telephone or another electronic means. The corporate domicile of an IBC may be changed from The Bahamas to another jurisdiction. An IBC may merge or consolidate with another IBC or with an ordinary company under the Companies Act, provided that the surviving entity is an IBC. An IBC may also merge with a foreign company. Bahamian IBCs are exempt from all business license fees and do not require a license under the Business License Act. Shareholders are exempt from all income taxes, capital gains taxes and corporate taxes. Further, there is an exemption from inheritance, succession and gift taxes, stamp duties in respect of transfers, and foreign exchange control regulations. Bahamian IBCs may be registered within twenty-four hours. Provide a registered office for companies. Makes or maintains deposits with a person carrying on business within The Bahamas. Makes or maintains professional contact with counsel and attorneys, accountants, bookkeepers, trust companies, management companies, investment advisers or similar persons carrying on business within The Bahamas. Prepares or maintains books and records within The Bahamas. 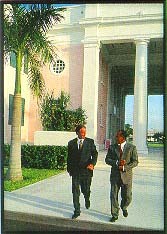 Holds meetings of its directors and members within The Bahamas. Holds a lease of property for use as an office from which to communicate with members, or to prepare or maintain company books and records. Holds shares, debt obligations and other securities in an IBC or an ordinary company. Holds shares, debt obligations, or other securities which are owned by any person, IBC, or ordinary company resident in The Bahamas. While no financial reporting requirements exist, an IBC must keep certain documents, such as share register, minutes of meetings and resolutions at the company's registered office in The Bahamas. Transact foreign exchange business without Exchange Control restrictions. Issue registered, bearer, voting and non-voting, no par value, unnumbered, common, preferred, or redeemable shares. Issue shares that may have more or less than one vote per share; be voted only on certain matters or only upon the occurrence of certain events; be voted only when held by persons who meet specified requirements; or entitle participation only in certain assets. Issue options, warrants or rights, or similar instruments. Purchase, redeem, or otherwise acquire and hold its own shares. Guarantee a liability or obligation of any person and to secure any of its obligations by mortgage, pledge, or other charge of any of its assets. Protect the assets of the company for the benefit of the company, its creditors and its members, and any person with a direct or indirect interest in the company. Hold Board of Directors' meetings anywhere and by means of electronic telecommunications. Address of the IBC's registered office and agent within The Bahamas. Objects or purpose for which the company is to be incorporated, which can simply refer to the Act. Currency in which the shares of the company will be issued. Authorised capital of the company, giving total number of par value and no par value shares that the company is authorised to issue. Number of classes and series of shares; the number of shares of each such class and series and their par values or no par values. Designations, powers, preferences and rights, and the qualifications, limitations or restrictions of each class and series of shares that the company is authorised to issue. Number of shares to be issued as registered or bearer shares and whether they are exchangeable. Manner in which a required notice to members is to be given to the holders of shares issued to bearer. Articles of continuation approved by a majority of the directors or the other persons who are charged with exercising the powers of the company, or in such other manner as may be established by the company. Articles of continuation to contain the name of the company and the name under which it is being continued; the jurisdiction under which it is incorporated; the date on which it was incorporated; the information required to be included in the Memorandum; the amendments to its Memorandum and Articles, or their equivalent, that are to be effective upon the registration of the articles of continuation. Name of each participating company and the name of the surviving company or the consolidated company. Designation and number of outstanding shares of each class and series of shares and the voting entitlement of each such class and series for each participating company. Specifications of each such class and series entitled to vote as a class or series in each participating company. Terms and conditions of the proposed merger or consolidation. Any Amendments to the Memorandum or Articles of the surviving company to be brought about by a merger. Everything required to be included in the memorandum and Articles for a company incorporated as an IBC. Name of each participating company and the name of the surviving company. Designation and number of outstanding shares of each class and series of shares, and the number of shares of each class and series of shares in each subsidiary company owned by the parent company for each participating company. Terms and conditions of the proposed merger, including the convertibility of shares, debt obligations, other securities or money or other property. Bahamian IBCs must comply with the provisions of the IBC Act and foreign companies must comply with the laws of their own country. a) An agreement promising to honour any future claim, debt, liability, or obligation of a Bahamian IBC, or to protect the rights of IBC shareholders. b) Irrevocable power to the Registrar to act as agent in the above procedures. c) Agreement that it will honour awards due to IBC shareholders. d) A certificate of merger or consolidation issued by the appropriate authority of the foreign jurisdiction where it is incorporated or such evidence as the Registrar considers acceptable.